A commandment in the Torah to go camping . . . how cool is that? But it’s true! We’re actually told in Leviticus that we should live in sukkot for seven days. It’s a good thing that choref hasn’t come to Israel yet, so we don’t have to worry about rain. As Jonathan, Liat, and Eran are building a sukkah and waiting for Eran’s friend, Ido, to arrive with the schach, we will get to hear about some of the wonderful traditions associated with the holiday of Sukkot. One of the most important and well-known of these traditions is the mitzvah of the four species--arba-at ha-minim. We bundle three special types of branches, and we hold them together with an etrog--a citron (a delightfully-scented citrus fruit native to Israel). Then we say a blessing and wave them in six different directions. What a perfect opportunity to practice all the directions in Hebrew! Remember? from Lesson 16 . . . 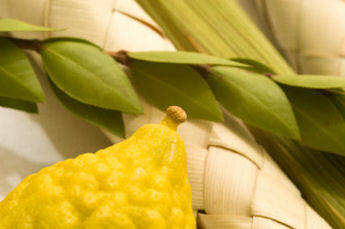 So make some wonderful memories this Sukkot. Enjoy spending time in the suka. Look up at the kochavim through the schach. Maybe even try to count them . . . be-Ivrit, of course! chag sameyach!